A long long time ago, when I didn’t have my own blog, when I didn’t know that there was something called Instagram, I found one beautiful picture on the internet. That picture led me to continuous clicks and I finally found a blog called “Cafenohut”. Ever since that moment, Cafenohut was saved in my bookmark bar and Cafenohut Pinterest was my eye candy jar. I thought this blogger was a genius and that belief hasn’t changed a bit! Ayda Algin, the lady was like a movie star to me. I wished to know her better and to say hi, if there’s a way. 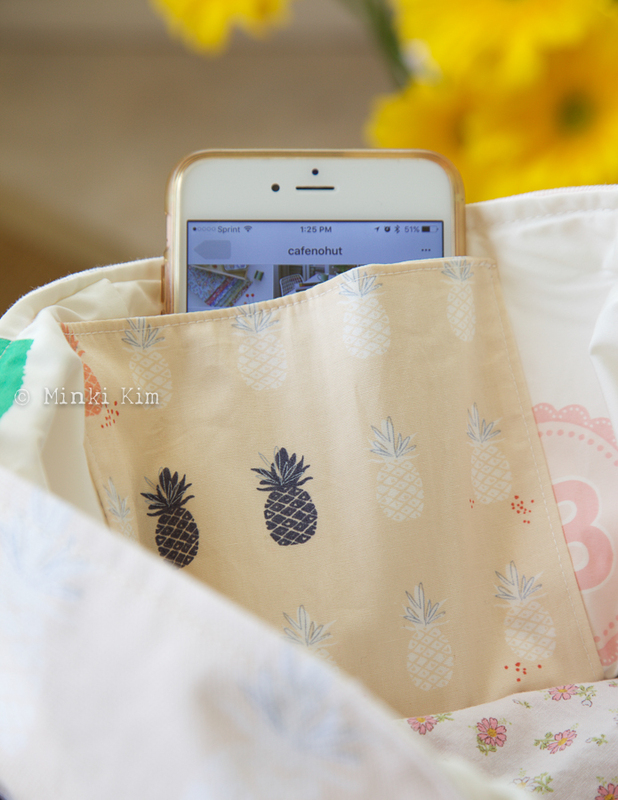 I never knew this kind of day would come – we call each other friends and she made so many charming projects from my book Sew Illustrated (co-authored with Kristin Esser) and I made some projects from her book! Oh boy, life is full of amazing things that I haven’t turned the pages to yet. So I hope you understand the excitment that I had when I received her first book and the pure congratulations that I want to send her. As we all do when we get a new book, I flipped through her book from cover to cover, over and over……until I decided where to start. Don’t you love the feeling a fresh new book gives? Don’t you postpone the moment of “DO”? 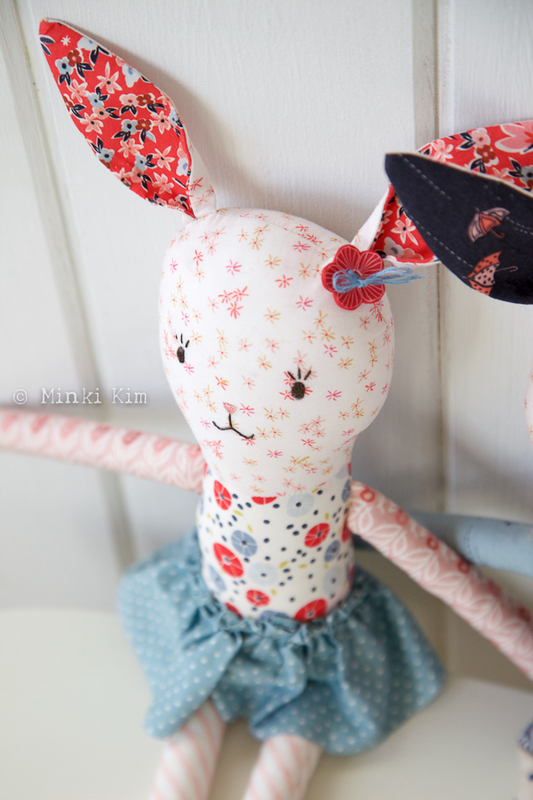 How I love making dolls and not just because I have three girls. 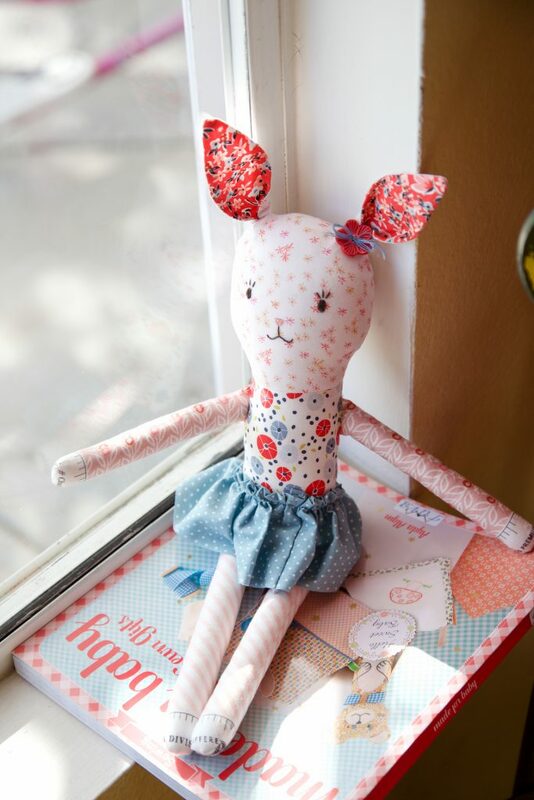 I was born to make dolls because my very first doll was almost twenty years ago when I wasn’t a mom and didn’t know how to use a sewing machine. 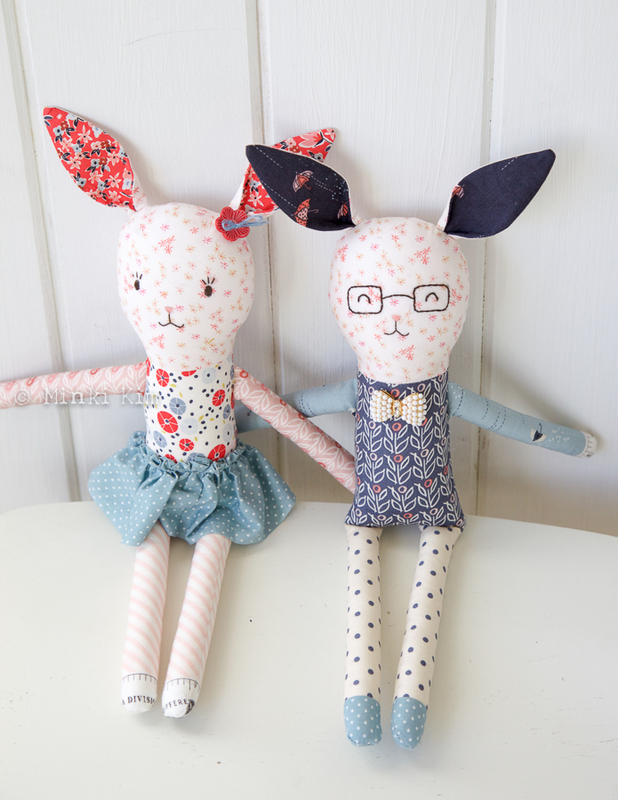 I just loved making dolls by hand and enjoyed giving them to my friends. 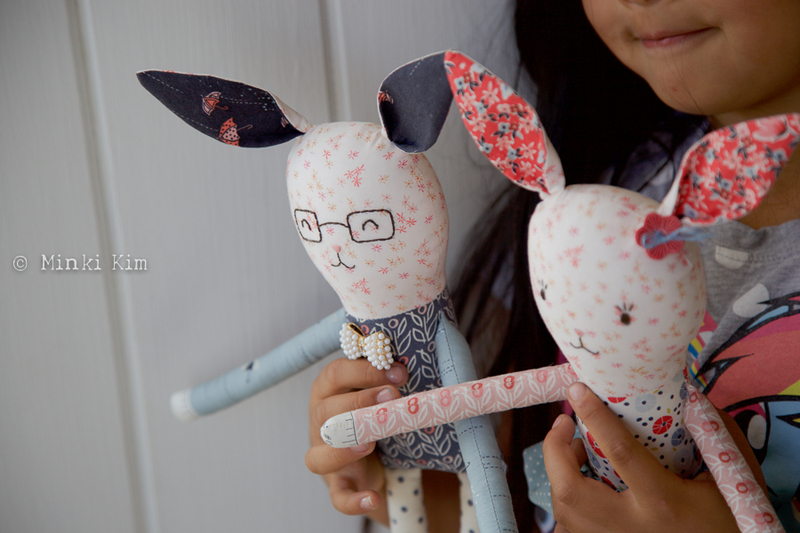 So I would like to thank Ayda for including a doll project in her first book! I am warning you to be careful. 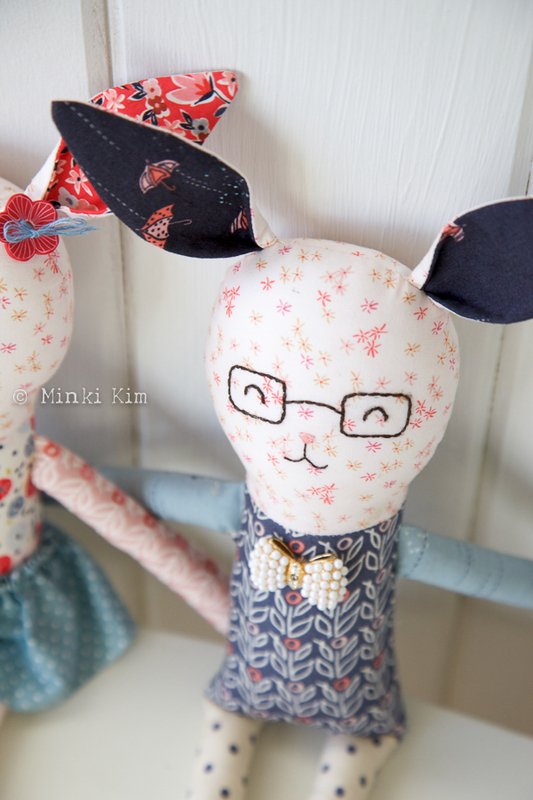 Because you will end up making at least two or more bunnies. It’s hard to stop making at only one bunny. I am serious, my friend. Be careful if you are going to make the bunny. Claire named them Mr. and Mrs. Bunny and brought all kinds of bunny shaped dolls in the house and insisted they were this bunny couple’s children. You never have enough bags, right? I would be the most stylish mama in town. I wish to go back and hold his bag instead of hot pink Wallmart brand bag. And can you tell what’s peeking inside of the bag? It’s Kristin’s project and she will give it to my Claire. Hooray!! Her stop is on May 16th so don’t forget the reveal of this secret project! 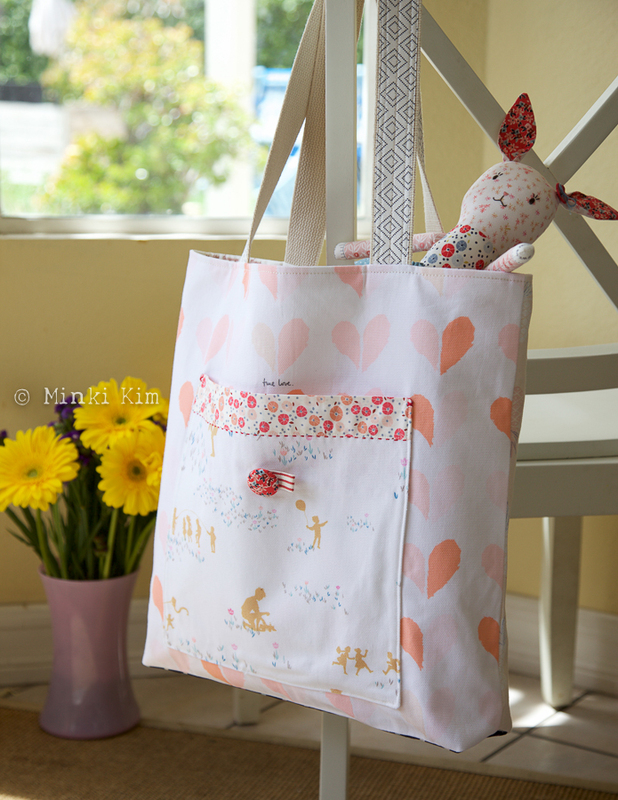 You may already noticed that I used Amy Sinibaldi’s fabric collections for this project. 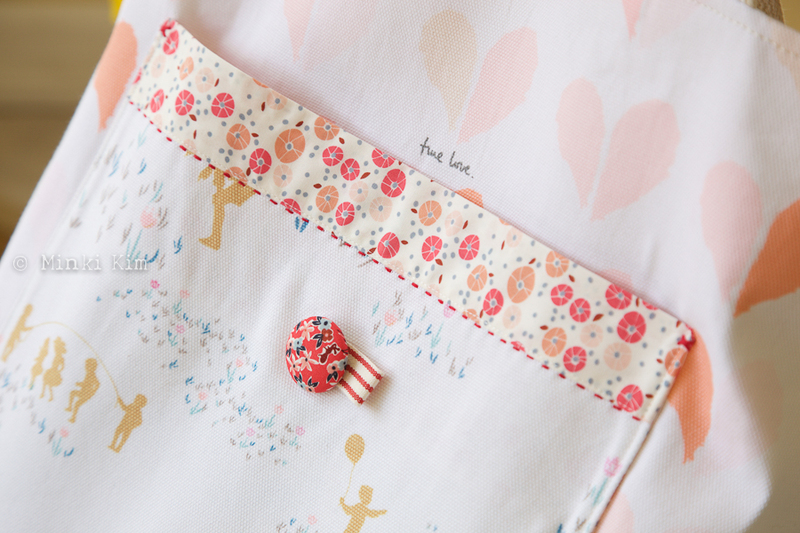 I love my brillant idea to add hand stitches on the pocket. I think a little subtle detail that supports the project, is like a chorus song that complete the beautiful melody. 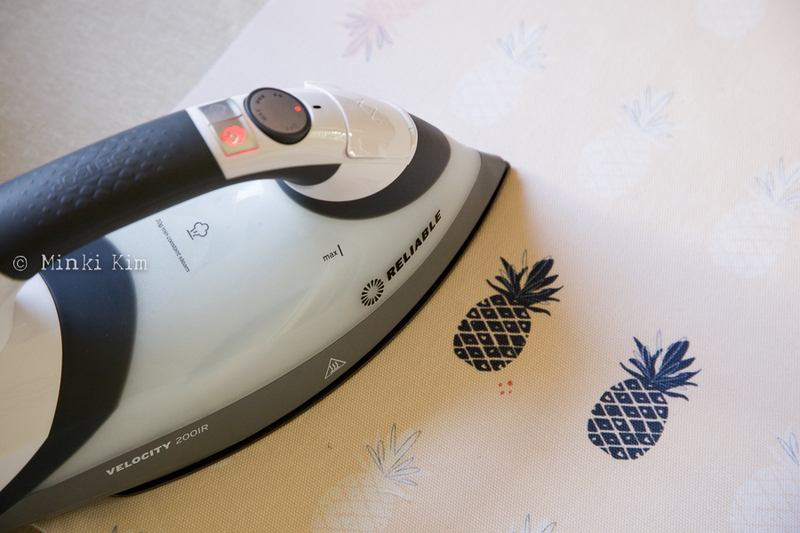 Pineapple canvas fabric is from Amy’s Charleston collection. As I used bright fabric for the bag, I added dark canvas that I had for long time to protect the bottom from getting stained. 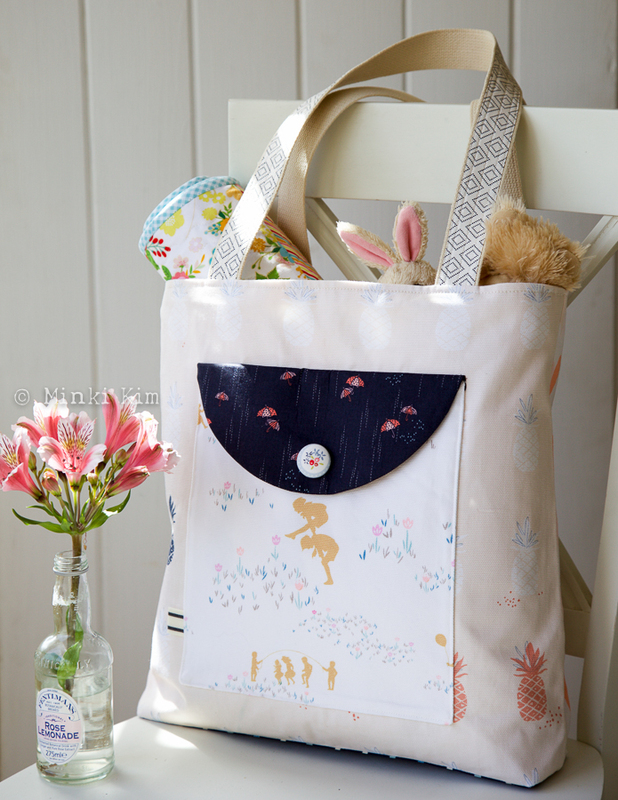 Yep, I am going to baby my bag. Ayda created so many fun details here and there. Simply following her inspiration was so easy and playful. 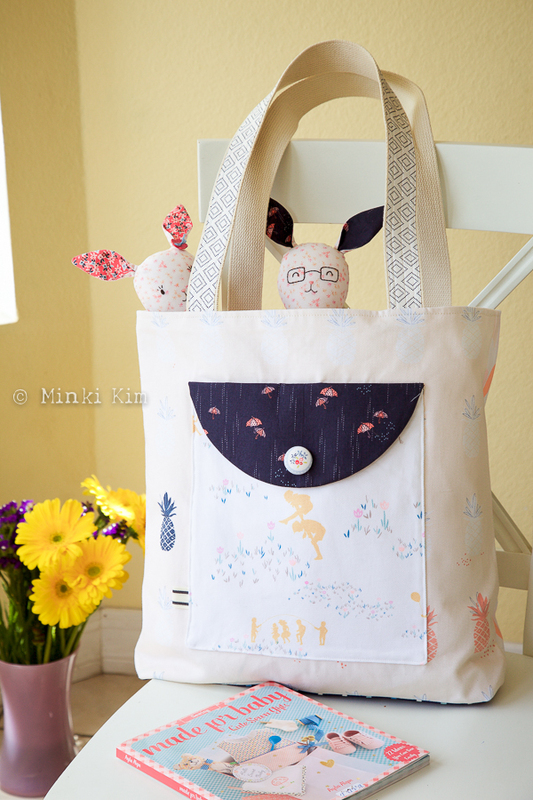 It was so much fun project for mama who has 7, 11, 13 years old daughter. 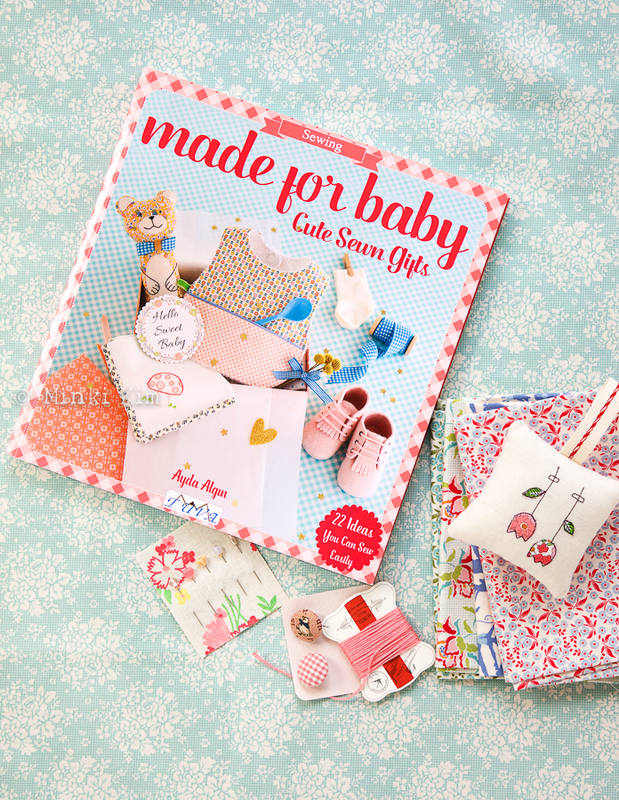 If you have a baby or are pregnant, this book will make you busy making gifts for you and your baby. If you have grown up kids, look at me–I had fun so why not you? Thanks for stopping by and thank you, Ayda for giving birth to this beautiful book! You are a treasure! 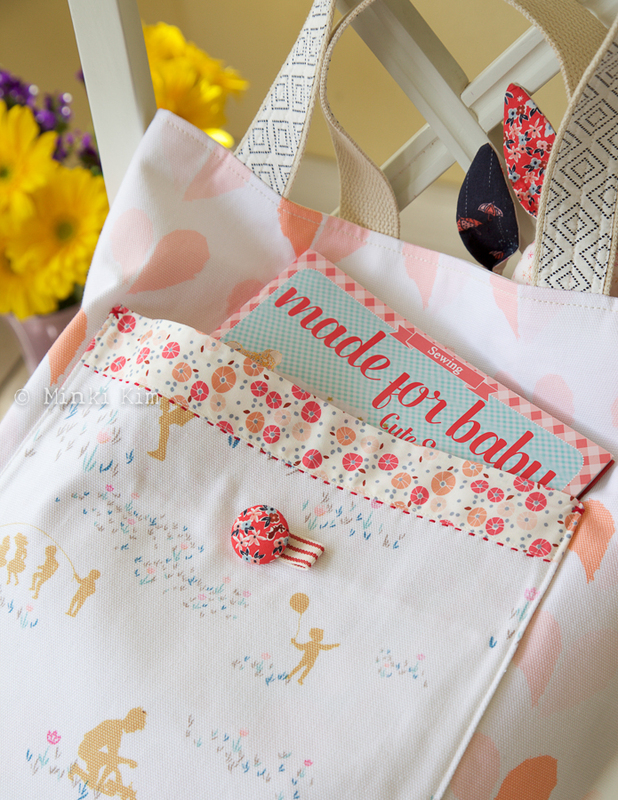 Made for Baby, by Ayda Algin for Tuva Publishing is bursting with inspiring projects and is available now from Amazon. We hope you will follow along on the Blog Tour to find out more about this gorgeous book. 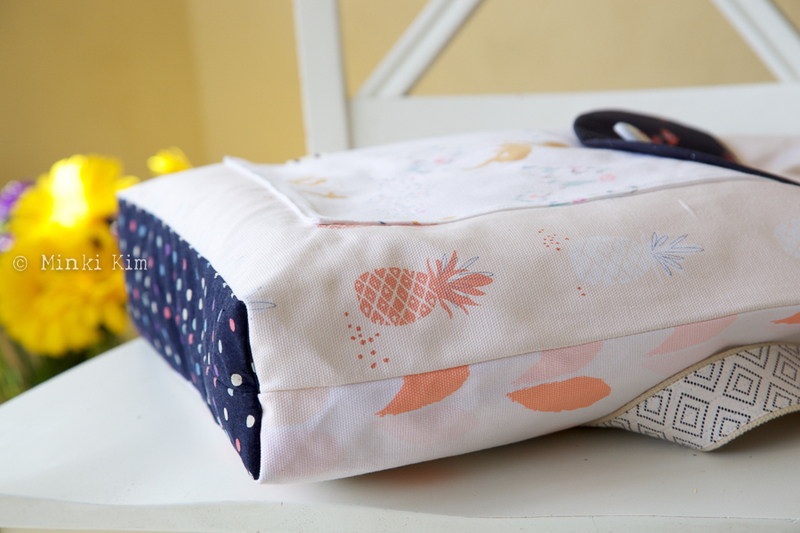 Check out the stops below to see what these talented designers are making from Made for Baby. Don’t forget to head over to Ayda’s blog, Cafenohut, for an opportunity to enter her giveaway. I don’t know how to thank you enough! You have given me encouragement and always inspired me. I am grateful for your support. From the bottom of my heart, I want to thank you so much my dear friend for being with me here. And of course I fell in love in your creations! Hi Samantha! It’s my luck day to talk to you. I have been a big fan of your amazing works but was too shy to say hello. Thanks for your kind words! Thank you so much for sharing your beautiful thoughts and words here with me. I read it slowly over and over and got happy!! oh such beautiful makes Minki! You are so talented and the little extras that you add make it so special. Love everything that you make. You are one of my blog treasure friend! Thank you so much for constant encouragement. I truly appreciate your friendship!! 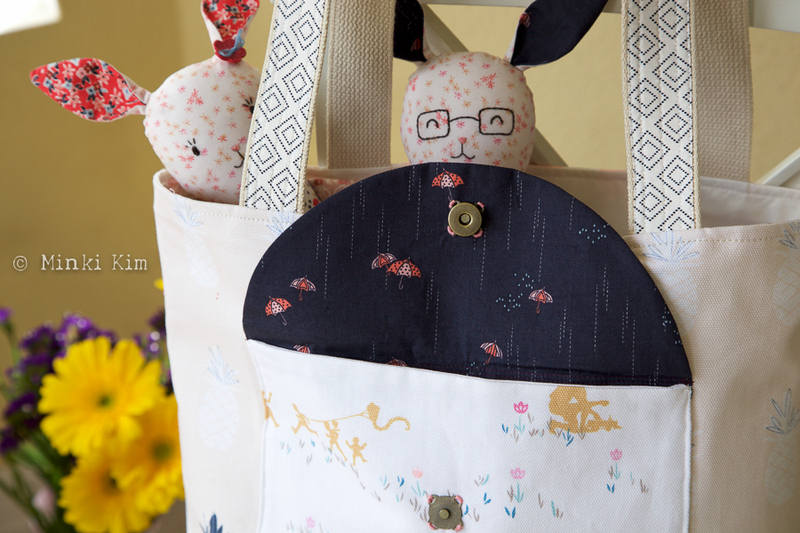 HI, your projects are so neat>Love the Bunnies! Thanks for sharing! Thank you for stopping by and sharing your time with me. Love every words you wrote and it made me so lucky person! !